The following is our complete inventory of Shure SLX Series Wireless Microphone Systems and accessories along with key technical specifications. All of our wireless systems rentals include a fresh pair of AA alkaline batteries. 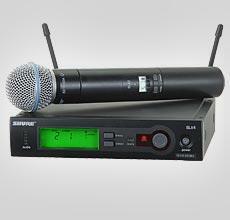 We offer three (3) types of wireless microphones: handheld, lavalier (lapel) and headworn. Wireless lavalier (lapel) and headworn microphones (along with a small body-pack transmitter) offer the unltimate hands free experience. Whether it's for a sound installation or a working band on the road, audio professionals need powerful wireless tools that can be set up quickly and used confidently. Shure's rugged SLX Wireless Systems exceed these demands with innovative automatic set up features, exceptional wireless clarity and legendary Shure microphones. Supporting up to 20 compatible systems across multiple UHF frequency bands, SLX smoothly integrates into houses of worship, lecture halls, conference rooms and mobile gear cases. User's manual including quick set up instructions.